Welcome to 'The High-T Website', a tribute to the classic children's ITV programme T-Bag. This website started in late 2003 as a small voting website but has grown during the past few years into the most informative and most regularly updated T-Bag site on the web! Look out for these features exclusive to this website: Cast & Crew interviews, Biographies, Magazine cuttings, Trivia, Quizes, Links, T-Bag Merchandise Info, Image Galleries, Favourite quotes, Voting polls, Video clips, T-Bag communities and much much more! Use the menu, to the left, to guide you to all the other pages of this website, a guide to the T-Juntions through time and (cyber) space. If this is your first time to the website you might want to look at the Navigation page to help you explore the website fully. 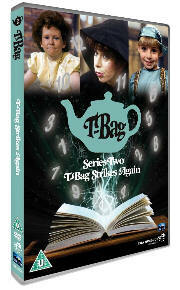 This is a website dedicated to the CiTV programme of the 1980's and 1990's called T-Bag. 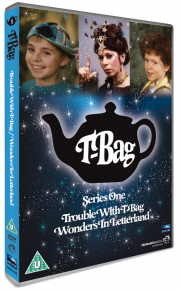 There was nine series and four Christmas specials of T-Bag (under different series titles such as Wonders In Letterland (later renamed Trouble With T-Bag); T-Bag Strikes Again; T-Bag Bounces Back; Turn On To T-Bag; T-Bag And The Revenge Of The T-Set; T-Bag And The Pearls Of Wisdom; T-Bag And The Rings Of Olympus; T-Bag And The Sunstones Of Montezuma and Take Off With T-Bag) which ran from 1985 to 1992 in the UK and was also shown in Australia much later. 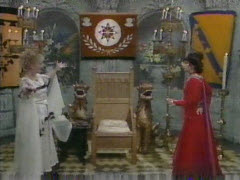 The series all had a similar plot, a little girl (namely Debbie, Holly, Sally, Polly and Penny) went off through mysterious and magical lands to collect up magical items that had been scattered by T-Bag (or someone else) these magical items included gold letters, silver numbers, gold bells, crystals, silver spoons, pearls, gold rings or powerful sunstones and return them all to where they rightfully belong. T-Bag could either have been destroyed by these items (this is why she scattered them) or T-Bag could gain immense power from them. Every episode was a quest to find the next magical item before T-Bag did. In the last episode of the series T-Bag would be banished but somehow managed to revive her magic by the tea brewed from her magical and evil T-Weed (called a T-Plant) and only T-Shirt could brew her up a wickedly powerful cuppa. I hope you enjoy your time here and if you want to find websites for other children's TV programmes you may find what your looking for on my Children's TV Programmes Links page! Celebrations for T-Bag's 34th Anniversary have begun! 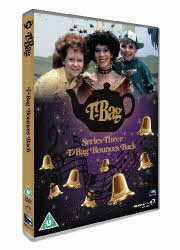 On the 4th April 2019 T-Bag celebrates it's thirty fourth anniversary since broadcast of the first episode back in April 1985. To celebrate this anniversary The High-T Website has had several updates added. Is it really four years since the thirtieth anniversary? If you've missed it you can still watch the 30th anniversary tribute video to the right featuring excerpts from all 94 T-Bag episodes! First three series available on DVD now! The first three series (Wonders in Letterland, T-Bag Strikes Again and T-Bag Bounces Back) are now available to buy on DVD, current online retailers can be found below. To find out more about the DVD releases and links to retailers where you can purchase the DVDs please see the Wonders In Letterland DVD page, T-Bag Strikes Again DVD page and T-Bag Bounces Back DVD page. Buy T-Bag on DVD now! Revelation Films have also launched a fan-zone section of the website which currently has an interview with Lee Pressman and Grant Cathro; Jim Norton and John Hasler. The T-Bag Fan Club is the place on Facebook to talk about T-Bag with other fans, with over 250 members why not join in the fun. How did you find The High-T Website? Please vote in the poll to the left on how you found this website. This website is best viewed at 1024x768pixels or higher. If you remember the children's ITV programme called C.A.B (1986 - 1989) please visit my sister-site all about C.A.B.